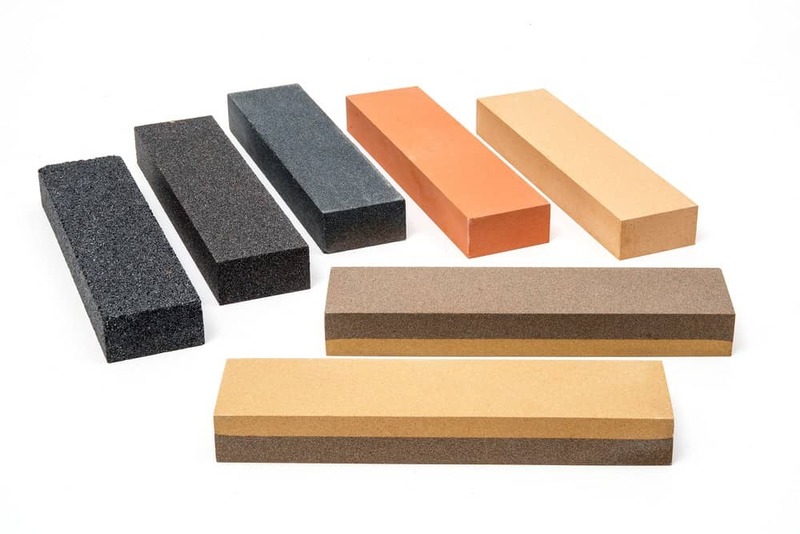 Confused on what sharpening stone to buy for your dull knives and tools? Then read this article as I may have the solution for your purchasing dilemma. After doing a lot of research, I have rounded up five of the best sharpening stones in the market today. Buying a sharpening stone can be very difficult especially with the many varieties available in the market now. This has caused a lot of confusion to experienced sharpeners, let alone the novice. If you would like to know how to select for the right sharpening stone for your needs, keep on reading. When buying sharpening stones, the most common types that you can choose are water stones, oil stones, and diamond stones. You can learn their differences in this v﻿﻿id﻿﻿eo. Water stones use water as a lubricant to create a quick-cutting slurry. In comparison to oil stones, water stones are softer and easier to clean because they don't leave any oil remains on your blades. Most people prefer this type of stone because they're effective at making a very refined edge. Oil stones are conventional stones that you usually find in the back shed. Although there are already man-made oil stones, many are still created from natural materials. As the name would suggest, oil is used as a lubricant because it creates a great friction between the blade and the stone. Many are not big fans of these types of stones because the oil used can go rancid. Diamond stones may appear to be the best quality sharpening stone, but they can be very expensive. These metal plates can stay flat than their other stone counterparts. However, they can leave damage to the blade. Before you start sharpening, position your stone securely with a base. On the coarse side, begin sharpening at the heel all the way across. You want to do this from one side to the other with little pressure as possible. You can watch how this is done properly in this video. On the finer side, do the same thing and alternative from side to the other. Just keep stroking until the blade is smooth out. The convenience of sharpening knives can be determined by the size of the sharpening stone. The larger the size, the better. You can sharpen small knives in a large sharpening stone but never the other way around. When sharpening bigger knives, the length of the sharpening stone is more significant that its width. Sharpening Supplies recommends a minimum length of 8 inches. You can usually find this size in most sharpening stone brands at a reasonable price. If you like more efficiency, then look for a sharpening stone with a two-sided grit: coarse and fine. The coarse grit will get rid of the nicks, adjust the bevel, and sharpen a very dull edge of your knife. The fine grit will refine the edge of your knife. 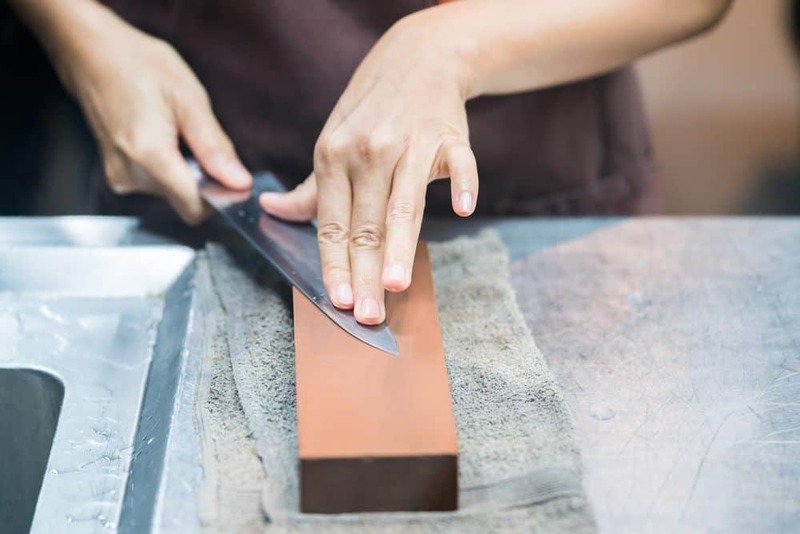 Instead of buying two sharpening stones- one coarse stone and one finer stone- for your complete knife sharpening needs, it is advisable to select a combination stone. Not only it is effective, but you can save costs in buying two stones. The safety of your sharpening stone can be determined by its non-slip secure base. Since we'll be dealing with knives, a little slip of the stone while sharpening can be very dangerous. Most models have silicone bases to keep the stone fixed while sharpening. To save costs from buying many stones for different knives, look for a sharpening stone that can work on any blade. 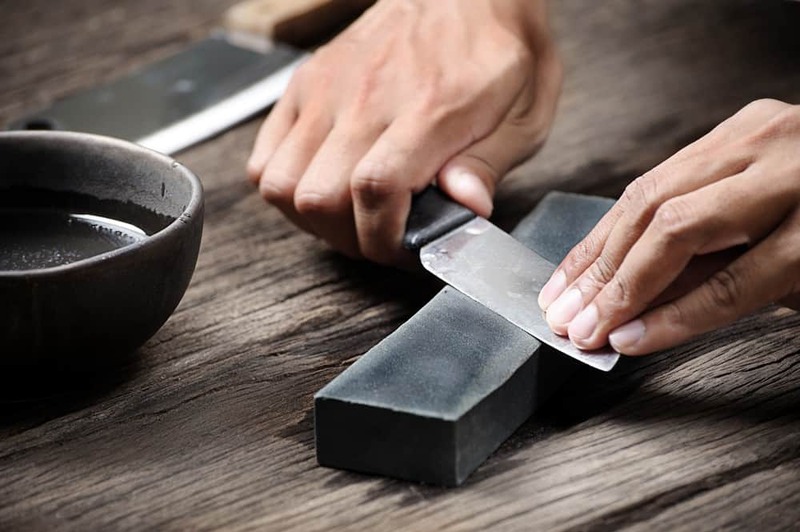 The best sharpening stone should work not only for kitchen knives but also for other types of blades, such as scissors, pocket knives, and hunting knives. The Mighty Dreams Premium Knife Sharpening Stone is dual sided stone with 1,000 grit (coarse) and 6,000 grit (fine). An angle guide is included to sharpen blades at correct angles. Among the many blades that it can sharpen include kitchen knives, scissors, and razors. This water stone is guaranteed safe because it comes with two bases: one silicone base to hold the stone and another nonslip bamboo base for better security. Measuring around 9.2" (length) x 4.3" (width) x 2.7" (thickness), this gives an ideal size in sharpening various blades. The Utopia Kitchen Double-Sided Knife measures around 7" (length) x 2.4" (width) x 1.06" (thickness). This double-sided stone is composed of 600 coarse grit and 1,000 fine grit. Made of high-grade corundum, it promises to give effective sharpening outcomes. The amazing part of this stone is it can work on all types of knives including ceramic and serrated knives. It is built with a nonslip-resistant rubber bottom to stay fixed while you stroke the knife into the stone. This is easy to use since you don't need to add sharpening oil. The DeBell Sharpening Stone is a two-sided model with a coarse side (400 grit) and a finer side (800 grit). This water stone is made by heating a silicon carbide at the temperature of over 1,000 Celsius making it harder. A non-slip silicone base is designed to keep the stone securely in place while sharpening. You can sharpen many types of blades with this sharpening stone, including kitchen scissors, pocket knives, and even garden tools. It measures around 7.1" (length) x 2.4" (width) x 1.1" (thickness). For optimum use, use the whole surface of the stone and not on the middle part only. The BearMoo Whetstone 2-In-1 Sharpening Stone is a dual sided stone with a coarse 3000 grit and fine 8000 grit. Made from high-grade white corundum material, it guarantees an effective sharpening results. This whetstone can work on almost all types of blades except for ceramic knives and serrated blades. The non-slip silicone base prevents your stone from slipping while you sharpen dangerous blades. The best thing about this product is it offers a 30-day money back guarantee if you're not satisfied with its performance, without hassle and questions asked. Measuring around 7.09" (length) x 2.36" (width) x 1.18" (thickness), it provides an good performance. The King Two Sided Sharpening Stone is made of two grits, 1,000 (coarse) and 6.000 (fine). It measures about 7.25" (length) x 2.5" (width) x 1.0" (thickness). A plastic stand is included to hold the stone securely while you sharpen the blade properly. This stone is best for sharpening kitchen knives made of steel and carbon. However, it can't work on ceramic knives and serrated blades. Based on the ratings above, the best sharpening stone is the Mighty Dreams Premium Knife Sharpening Stone because it met most of the features for a good product. Mighty Dreams is made of dual grits (1,000/6,000), has a longer length at 9.2", versatile, and made of two bases (bamboo and silicone). The Utopia Kitchen Double-Sided Knife Sharpening Stones comes close to second place. Have you tried using a sharpening stone? If yes, then let us know your experiences in the comments section below. You can also share this post if you like this post.